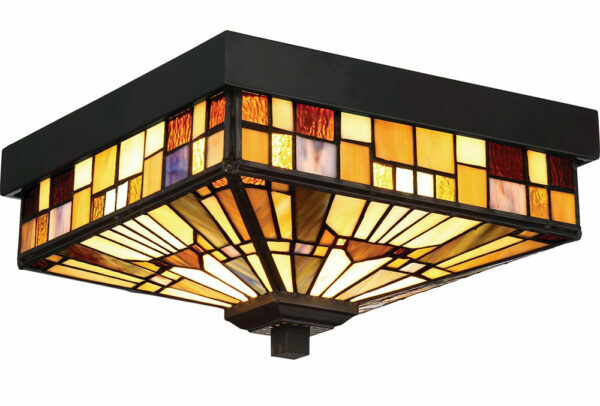 The Quoizel Inglenook 2 light flush outdoor porch lantern is rated IP44 and features Arts and Crafts Tiffany style. Featuring a square ceiling mount, drop sides and Art Deco inspired pyramid shade, with classic geometric design, handmade using high quality art glass in sapphire blue, warm honey amber and cream tones. The Arts and Crafts style is enduring and honours the tradition of fine craftsmanship and attention to detail. The valiant bronze finish metalwork and geometric Tiffany design combine to create a stunning porch light that will welcome visitors to your door after dark. Fully weatherproof and supplied with a manufacturer’s 3-year anti corrosion warranty, which relates to the finish on outside lights like this one. There are matching fittings available in the Inglenook exterior lighting collection, please see below. This exterior light is supplied by Elstead Lighting and designed in the USA by Quoizel, founded in 1930 in New York. Their designs embody a history of being artisans in glass and natural materials that illuminate your living space and enhance the beauty of your home, such as the Inglenook 2 light flush outdoor porch lantern and rated IP44 featured here.